There are so many different ways to use toothpaste other than brushing!! I always keep a travel size tube of toothpaste in my purse or car. You can get some for free using coupons so it’s easy to stockpile, that’s why it’s one of my favorite cheap cleaning tips. 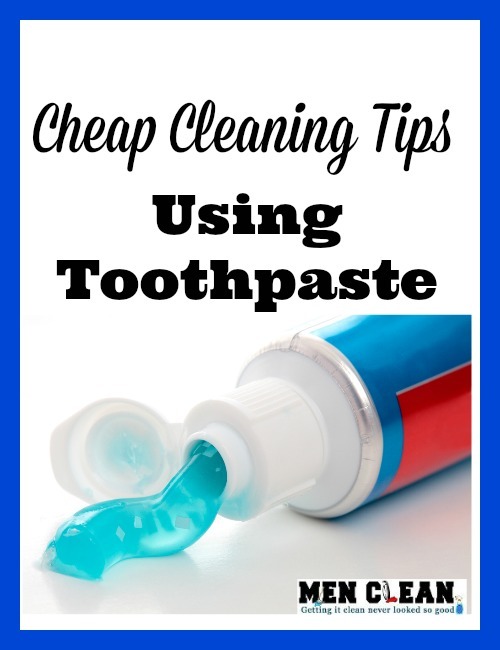 I have a list over 20 ways you can use toothpaste to help you. 1. One of my favorite ways to use toothpaste is getting rid of water marks on your furniture. You can’t always control where you guest lay their glasses so if you do end up some rings on your furniture just rub some toothpaste (non gel kind) on the furniture and wipe off with a soft cloth. 2. If your glasses come out of the dishwasher with scratches take some toothpaste and just polish your glasses with just a tiny drop of toothpaste til they shine like new again. Same thing goes with your glasses or if you have a scratched watch. It will also do wonders on your car lights as well. If they get to foggy just rub some on and buff off! 3. You can also revive that nasty iron of yours. Make sure your iron is cool and then you can scrub with a soft cloth and rinse clean. Should be good as new again! 4. This summer before going to the beach or pool take your kids googles and rub a little bit of toothpaste inside for a fog free swim! 5. If you have glass shower doors that have got really foggy, give them a good cleaning, let it dry then rub some toothpaste on it making circles then rinse clean. 6. How many times have your kids asked you to hang posters on their walls but you don’t want tape or nails on the wall??? Well next time you can say yes because it you use a dime size amount to hold it up it will dry and keep the posters up and then when you are ready to take them down you just wipe off the toothpaste with no damages to your walls! 7. If you have any scuff marks on your shoes you just take some toothpaste to remove the marks gently! 8. This is another one of my favorite ways toothpaste can save the day. Have any of your kids decided to draw you a pretty picture….one the wall!? Have no fear, instead of painting the walls just rub the marks with some toothpaste and a damp rag. Wipe again with a little water to get rid of the residue. 9. Toothpaste can also make your jewelry and silverware look as new again as well. Just scrub gently and wipe clean to sparkle again. 10 . Finally if you have any scratched up DVD’s or CD’s just gently rub a little bit over the whole disc and clean off. Works like magic! Hopefully some of these cheap cleaning tips will help you as much as they help me! Remember DONT use the GEL toothpaste on ANY of these tips. The paste works so much better! You will see a huge difference! Good luck and share with us some of your favorite ways you use toothpaste!